One book that has been getting a ton of buzz lately is the mash up Pride And Prejudice And Zombies. 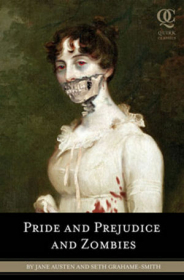 Seth Grahame-Smith has taken Jane Austen’s Pride & Prejudice and inserted a zombie sub-plot. First let me say that I’m a HUGE Austen fan. I’ve read Pride & Prejudice about 5 times (you can read my review here) and have watched the movie and mini-series more times that I’d care to admit. I also like to think I have a pretty good sense of humor, so I told myself going into this whole zombie thing, to have an open mind and go with the flow. I lasted about 3 pages before I chucked the book across the room. I picked it up, dusted it off, and inspected the back cover which says, “Jane Austen is the author of Sense and Sensibility, Persuasion, Mansfield Park, and other masterpieces of English literature. Seth Grahame-Smith once took a class in English literature.” I laughed. I picked the book back up and gave it another chance. I lasted about a 100 pages before I finally gave up on it. It just wasn’t for me. I liked the idea; I just think that it could have been done better. I was looking for a fresh take on an old story. Sort of like other movies and mini-series have modified Jane Austen’s work to make is something unique (Bridget Jone’s Diary, Clueless, Lost In Austen). When I first caught wind of Pride and Prejudice and Zombies I immediately thought Shaun of The Dead meets Jane Austen. Now that would have been freakin sweet! The book is actually not much more than line for line Pride & Prejudice with a word changed here, and a few sentences added there to make it about zombies. Reading it felt like ordering something at a restaurant that you could have made yourself. I know a lot of people out there think this book is brilliant and will not agree with me here, and that’s cool. I was actually hoping I’d like this book because I think that not liking it is going to make me about as popular as the time I admitted to a room full of music snobs that I hate Radiohead (which is also true). In summary, this book oozes cool factor, but in my opinion does not deliver. That being said, I think I’m in the minority here and you should still check the book out and decide for yourself. Buy Pride and Prejudice and Zombies by Jane Austen and Seth Grahame-Smith on Amazon here .